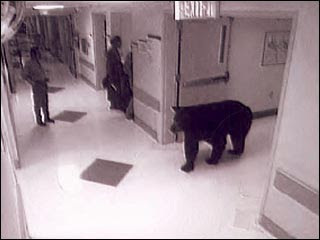 Yeah, I can't bear hospitals either! Last Wednesday I traded in my four hour work meeting for what was behind curtain number two...a fun 12 hour visit to the Emergency Room. It all started when I got up from my computer chair early at work and it felt like Andre the Giant had snuck up from behind me and was squeezing my chest. That's unusual because Andre has been dead for a few years now. Also, the whole thing made it difficult to breathe. Now I'm not stupid; I know most of the classic heart attack symptoms and this felt pretty darn classic. Classic as in Stairway to Heaven classic. But just how can a gnome owning, exercising, heathy eating, non-smoking, mostly non-drinking, non-stressed person be having a heart attack at 49? I felt the same way when I learned Sara Palin makes more money than I do..."this isn't fair!" The local clinics apparently aren't used to people with those symptoms walking up unnancounced. I think they're more used to their fear-induced drug-dependent slowly dying sorts that have a myriad of maladies because the TV commercial told them they did. So I walk in and tell the front desk person my symptoms and she directs me to another sad clinic waiting area with another front desk person saying "make an appointment there, you could get in tomorrow or Friday." "With heart attack symptoms? Really? Don't you think I might be dead by Friday?" I respond. The other front desk person wasn't so callous. Apparently she wasn't winning the game of solitaire most likely on her computer screen that I conveniently couldn't see. She sent me right in. So while I'm reading a two year old sports magazine...hey, the Olympics are coming to China!...they take a myriad of vitals. You know, your weight is important should you keel over. Then they know whether to soak your window for the cost of a heavy ok casket or a light pine version. One thing my side of the family has a history of is high blood pressure. Since I avoid all things medical, I didn't really know much about blood pressure other than they have these automated ones that could squeeze your arm into a Burger King straw...and enjoy doing so just to get two numbers I don't understand anyway. Still, apparently my numbers are good...111/60 when I'm not sitting in a clinic awaiting an ambulance. With that kind of stress it bumped up to more like 132/80. Still not bad though. So, I got yet another amubulance ride. Last time I rode an ambulance I had a bone sticking out of my arm and five fractures and kind of wanted some sort of pain medication after enduring that state for over an hour. This time I thought it was all a big over-production...kind of like the TV show Glee. At the ER it was a never ending session of tests. You do something and then you wait a couple of years for the result and then they do something else. EKGs, Cat Scans, ultrasounds...all important and life saving and all ridiculously boring. Ok...injecting the iodine for the cat scan makes you feel like you just peed your pants but it's pretty uneventful. In the end, it turns out my heart is fine...healthy as a horse (I don't know why people say that...it's not like horses are living 200-300 years or something). What they did find were two tiny blood clots in the lungs. Since I have no risk factors for getting them, they're wondering how they got there. I could blame it on clots in the legs from a long plane flight but I haven't even done one of those for awhile. They did an ultrasound looking in the legs for others. Of course, I had to wait my turn among the pregnant. How joyous. "Congratulations, VE, it's a baby blood clot!" Actually, none were found in my legs. My symptoms were merely one of the clots getting obstructed in the vessels of the lungs. They have similar symptoms to those of a heart attack. All I have to do is take blood thinners for several months to allow my body to dissolve them. Blood thinners aren't exactly fun is you don't like needles...lots of needles. For the first six days I get the fun opportunity to inject a two inch needle into my stomach twice a day. They say it's to allow the thinner medicine to be accepted easier. I say its some cruel dark humor the nurses and doctors conjured up to break up their stressful days. Glad you went to the hospital! Glad that you are "pretty much" OK....although, you really don't have to go to such extremes just to find something to write about!! It's almost as if your body was saying "Y'know, we haven't done anything exciting for awhile... when was the last time we sent him to the hospital?" And then they started planning accordingly. Glad to hear things are ok... all except for the part about the two-inch needle going into your stomach twice a day. Think happy thoughts about crayons and fruity rum drinks. As a heart attack survivor, I'm one of those "better safe than sorry" types. Glad to hear it's mostly benign. i knew what you meant by PE. good lord, that is seriously scary. that's some dangerous stuff. i'm glad you're ok though and pray the thinners do their job. Only you, VE, only you. janna - The good news is that I have the "Something always happens to VE" annual event out of the way for this year now! roy - Here, here. It's always so much more difficult to say "oops" when you're dead! lime - It's a bit like killing a gnat with a sledge hammer in approach but why not use superior fire power when life is on the line! Hospital? Doctors? Horrors! And what is it with all th' bad humour? I mean really...seems th' auld "beside mannerisms" have vanished, wot? I am so glad you're okay, VE! Oh, my word, how scary! I'm glad you fought your "guy instincts" and went and got checked out. Hope you're feeling much better by now. Wow VE! Glad you're okay. And needles in the stomach? Can't you just start a daily regimen of Bayer? I hate needles. With a passion. I'm glad it wasn't an MI, but pulmonary embolisms are nothing to ignore, either! So, are you gonna live? Serena – I know…and I didn’t even ask for directions to the clinic! Secret agent woman – What’s an MI? Monkey inlaws? Mole inspection? Whoa that's a bit of a worry. My husband died at 35 years of age. Apparently fit as a fiddle and totally unexplained heart attack. So you're lucky you recognised a problem and got it sorted in time. Just because you say you're not dead doesn't mean I believe you. I feel your pain, VE... I got to give myself injections of blood thinners for a whole month after I broke my leg. Good times. 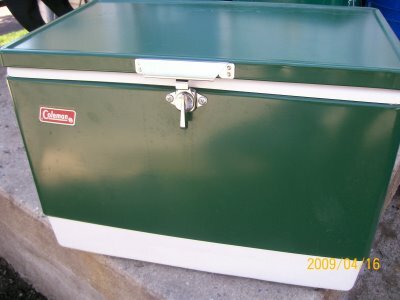 But I must say, the Coleman coffin gave me my first coffee spewing LOL of the day! Thanks for that! baino - Wow, I didn't know that. Sorry to hear...that's really young. boom boom larew - Coffee spewing is an honor here! As Worf once said, "Assimilate THIS."